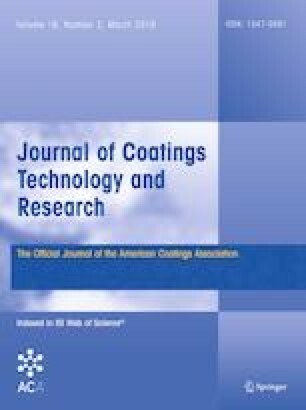 Synthesis, characterization, and coating performance of castor oil (CO)-based waterborne hyperbranched polyurethane acrylate (WHPUA) emulsions are highlighted in this work. Herein, a second-generation CO-based hyperbranched polyester (C20) was synthesized by introducing the renewable CO as a B3 core and dimethylolpropionic acid as an AB2 monomer via a pseudo-one-pot condensation procedure. Three types of CO-based WHPUA emulsions were prepared through the addition of the hyperbranched C20 with maleic anhydride (MA) and the isocyanate-bearing semiadduct (IPDI-HEA) at different MA/IPDI-IH molar ratios without the addition of any emulsifiers. The prepared emulsions were further formulated into UV-curable coating formulations and exposed to a medium-pressure mercury lamp. Consequently, the obtained UV-cured coatings exhibited outstanding adhesion performance, excellent transparency, and an acceptable degree of final double bond conversion. Owing to a relatively low concentration of hydrophilic units and a large number of acrylate functionalities in the waterborne oligomer, the obtained films were endowed with high crosslinking density and low hydrophilic nature, thus producing enhanced tensile strength, pencil hardness, water resistance, and chemical resistance. Due to their combination of renewable materials, a waterborne system and a UV-curing technique, these CO-based WHPUA emulsions offer promising opportunities to be used as environmentally friendly coatings. This research was supported by the Guangdong Academy of Sciences Project (Grant No. 2017GDASCX-0705).